For the past 37 years, the mission of the Mashburn/Marshall Tactile Gallery has been to enrich the museum experience of every visitor with special attention to those who are blind, sight-impaired, or have special needs. Mary Mashburn, co-founder of the Tactile Gallery and recent recipient of the Pikes Peak Arts Council’s Arts Advocacy Award, is enthusiastic and determined in her efforts to create greater community access to the arts. For quite some time now, Mary has been interested in adding a piece by local artist Sean O’Meallie to the Tactile Gallery collection. And the time is now. From the outset, the focus of the gallery’s collection has been museum-quality sculpture in various media. O’Meallie’s work, usually painted wood, is noted for its visual and tactile allure, and multilayered content. On the surface, the tasty new 3D printed addition offers Tactile Gallery visitors an inviting, multi-sensory experience of a timeless treat. Below the surface however, is a story of hope, strength, and finding comfort in the simple joys in life. Since its inception, the Tactile Gallery has been generously supported by the Colorado Springs Alumnae Chapter of Delta Gamma Sorority. At our September 17 reception and celebration, we honored one special Delta Gamma member with a very special acquisition into the Gallery’s collection. For the past two years, Delta Gamma alumna and Colorado College Woman’s Educational Society (WES) Member-at-Large Sarah Healy has been battling multiple myeloma, a highly aggressive blood cancer. Through her ordeal, she nourished her body and spirit during her treatment and hospice care through visits with family and friends to The Drive-In Tasty Freeze on North Weber for a chocolate-dipped chocolate soft serve cone. One of the few things she always had an appetite for, these cones embody the sweetness Sarah still finds in life. Sarah also knows that cancer patients and their caregivers need more practical and life-saving support. So, she founded a support group, Blood Cancer Awareness in Colorado Springs, to help inform, connect, and inspire those facing the intimidating diagnosis of blood cancer. 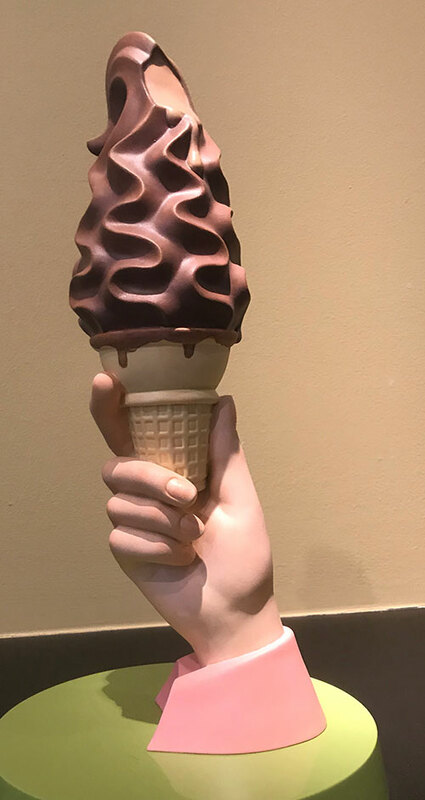 O’Meallie’s re-creation of Sarah’s hand holding the soft serve cone honors Sarah, her ties to Colorado College, and her support of the Tactile Gallery through Delta Gamma. When visitors to the Gallery see and touch the new sculpture, they will share in the hope, strength, and love of life of Sarah and all others battling this disease. Sean O’Meallie is from New Orleans and studied art at the University of New Orleans. Since 1977, he has resided in Colorado [Springs]. O’Meallie taught studio art at the University of Colorado in Colorado Springs for nine years and for ten years he was a toy inventor based out of New York, NY, creating toy concepts for the international marketplace. His sculptures have been exhibited and toured in the U.S. and Europe.